With business applications spanning everything from Microsoft Excel to cloud-based SaaS applications of every kind, on-premise ERP, HRIS, data warehouses and more – it’s no wonder integrating even two of these can be a hassle. Connect to any combination of Cloud and on-premise applications. No software or appliances to install or maintain. Instantly deploy anywhere in the world. Pre-built connectors for many common applications. Boomi Suggest™—leveraging the collective intelligence of the Boomi Community to accurately and automatically suggest common data mappings. 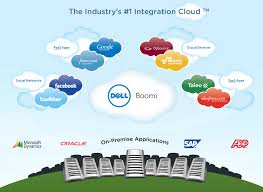 Boomi AtomSphere delivers high-end integration capabilities such as content-based routing, process flow control, exception handling, and messaging in a secure, highly scalable and easily update-able service access by any web browser.